"Always move forward," says Ahiya Klein, who nearly lost his sight in a clash with terrorists in Gaza. 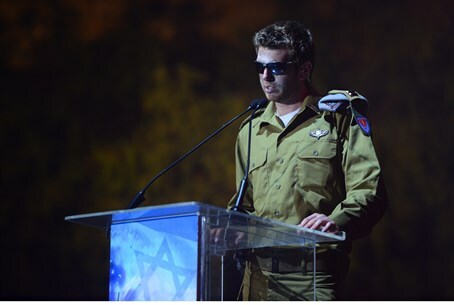 Ahiya Klein, the IDF soldier who nearly lost his sight in a clash with terrorists in Gaza, spoke on Sunday at a ceremony in honor of Yom Hazikaron (Memorial Day) which took place at the Sultan’s Pool in Jerusalem. During the ceremony, Klein gave an inspiring speech as he spoke about the ordeal he had undergone. Klein’s relatively fast recovery was described as a miracle by his family when, only a month after losing his sight, he was able to return home for Hanukkah and light the candles with his family. Also speaking at Sunday evening’s ceremony was Jewish Home Chairman Naftali Bennett, who spoke of the contribution of all sectors of Israeli society to the IDF. "Memorial Day is not a day that belongs to only one sector. The heroic courage and fighting spirit across sectors are a unifying factor for all the residents of Israel. This goes for all the IDF units, including the unit in which I served, Sayeret Matkal," said Bennett as he told the stories of two Druze soldiers, one of whom was killed during a training exercise.